CONDOR CRUISES (link >>) offers whale watching and trips to the Channel Islands aboard their modern, fast 75' Condor Express catamaran. This vessel departs from Santa Barbara Harbor at SEALanding (map >>). Check their current schedule of upcoming whale watching trips, adventure cruises to the Islands, and pelagic birding in the Channel, including deep water trips beyond the Islands. LOS ANGELES AUDUBON (link >>) offers trips around the Islands including the occasional deep-water trip scheduled at different times during the year to provide the best birding opportunities. Check their current pelagic trip schedule to make a reservation. Visit Los Angeles Audubon Society website for information. 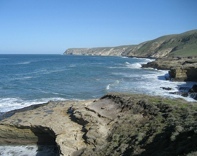 SO CAL PELAGIC BIRDING (link >>) is a service of Buena Vista Audubon Society in Oceanside, CA. This web site provides detailed information on numerous pelagic and deep water trips in southern California waters and the Channel Islands. ISLAND PACKERS (link >>) an official concessionaire to the Channel Islands National Park, offers trips for whale watching, pelagic birding, and guided hiking excursions with an Island Packers Naturalist or National Park Service Ranger. Day trips can be scheduled for hiking on Santa Cruz, San Miguel, Santa Rosa and Santa Barbara Islands, as well as overnight camping. Island Packers boats depart from Channel Islands Harbor in Oxnard, and Ventura Harbor in Ventura. TRUTH AQUATICS (link >>) has a fleet of three dive-boats and offers trips designed for day hiking and camping on the Channel Islands. Truth Aquatics is an official park concessionaire. Boats depart from Santa Barbara Harbor at Sea Landing. Check their current schedule of Island trips. CHANNEL ISLANDS AVIATION (link >>) is also an official concessionaire to the Channel Islands National Park. Channel Islands Aviation offers half day excursions and flights for camping to Santa Rosa Island in the Channel Islands National Park. Flights are scheduled year round. A flight to Santa Rosa Island is only 25 minutes away. Birds regularly found in the Channel include: Pink-footed Shearwater, South Polar Skua, Parasitic, Pomarine and Long-tailed Jaegers, Sabine's Gull, Scripps's Murrelet, Cassin's and Rhinoceros Auklets, Red Phalarope, Black, Leach's and Ashy Storm-Petrels, and Northern Fulmar (winter). 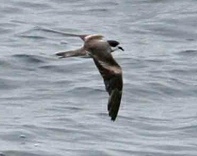 Black-footed and Laysan (rare) Albatrosses are found well offshore. Among the more spectacular sightings in deeper offshore county waters; Mottled Petrel, Cook's Petrel, Stejneger's Petrel, Red-tailed and Red-billed Tropicbirds, Magnificent Frigatebird, Brown and Masked Booby, Tufted and Horned Puffins, and Parakeet Auklet. In August 2005 a first northern hemisphere record of Ringed Storm-Petrel occurred west of San Miguel Island. It has long been determined by the California Bird Records Committee that for the purposes of reviewing rare bird records in the state, the review area offshore shall extend to the 200 nautical mile limit. The CBRC has also adopted "the nearest point of land" rule for determining where to assign records to a specific county in California around the Channel Islands. In short, it has been generally agreed that pelagic species are assigned to the county with jurisdiction over the nearest point of land. Determining the political boundary of Santa Barbara County offshore is a bit tricky when projecting a county line into the ocean around the Channel Islands. It is somewhat subjective since county jurisdictions only extend three miles out to sea.